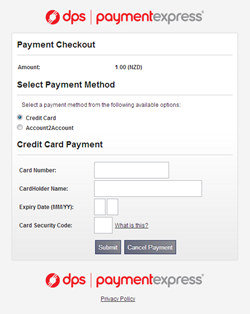 Payment Express is provided by Direct Payment Solutions Limited (DPS). Global leader in payment technology, and the largest online credit card processor in Australasia. PxPay 2.0 is the latest Payment Express Hosted Payment Solution, and is suitable for all web sites that need to process card payments in real-time. |Payment Express hosts and manages the payment page, which is secured by its own SSL certificate and customisable. Suited to all sizes of merchants, it is highly cost effective and operates on an extremely robust infrastructure. It also supports 3D verification with authentication of "Verified by Visa" & "MasterCard SecureCode", as well as being integrated with leading shopping cart providers.